Every wonder where the phrase "Saved by the bell" comes from? Obviously, it's a boxing term spoken when a fighter on the verge of defeat gets a few moments of reprieve in a break between rounds (signified by the ringing of a bell). Still, there's a persistent (though unsubstantiated) rumor that the roots of "Saved by the bell" go back much further than sports and have truly morbid overtones. It all ties into "safety coffins", those being coffins equipped with a bell that could be sounded on the surface, should someone find themselves the victim of premature burial. It's not that murderers were fond of this particularly terrifying method of dispatch in eras past, rather medical science has only recently been able to determine emphatically when a person is dead versus in a deep coma. In fact, safety coffins where still being constructed as late as the 1950s. 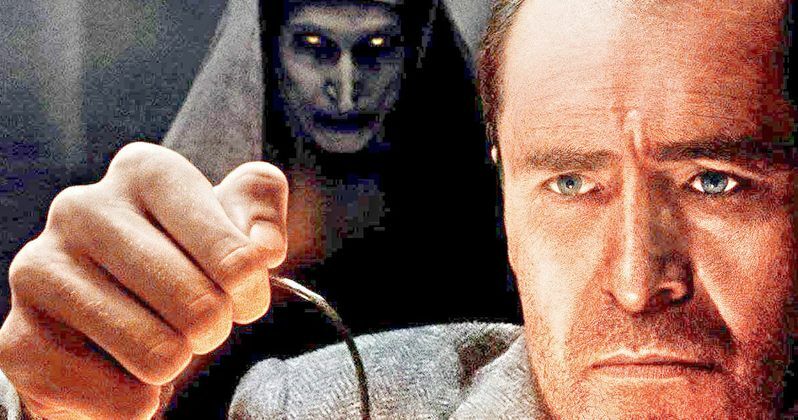 In the most recent TV spot for The Nun, the latest spinoff of The Conjuring franchise launched by James Wan in 2013, Father Burke (played by Demián Bichir) is hoping to be saved by the bell in a sequence sure to send claustrophobic viewers into hysterics. Give it a spin at the bottom of the article. Chronologically, The Nun takes place before Annabelle: Creation, making it the oldest chapter in The Conjuring universe (so far). The film was originally slated for release last July, but producers pushed it back to September hoping for a repeat of IT's tremendous financial success when that film was released last fall. In other Conjuring news, it was also recently announced that a 3rd Annabelle movie is in the works; though we don't have a release date at this time, we've been told that film will take place in Ed and Loraine Warren's "Haunted Museum" (the room where they keep all of their cursed objects locked away). The Nun is directed by Corin Hardy, a filmmaker who first hit horror fans' radars in 2015 following the release of his woodland creeper The Hallow; he was also attached to direct Sony's The Crow: Reborn before that project was scrapped earlier this year. The screenplay for The Nun was co-scribed by James Wan and Gary Dauberman, the later of whom has previously penned scripts for The Conjuring spinoffs Annabelle and Annabelle: Creation, not to mention 2017's IT. Bonnie Aarons is reprising the role of the demon nun Valak, a character she made iconic in 2016's The Conjuring 2. The film also features Taissa Farmiga (Final Girls, American Horror Story) and Charlotte Hope (Game of Thrones). Look for The Nun to begin haunting US theaters on September 7th.